A wonderful post about a favorite National Park… From a fellow blogger. On our final day in St. Mary, outside the east entrance to Glacier NP, the sun finally came out! We had to extend our stay here two days to take advantage of this day so we could do one of the best hikes in the park, the Highline Trail. For this hike we drove up the Going- to-the-Sun Road to Logan Pass, the highest point on the road. We parked the Jeep there to begin our hike. The trail follows along the Continental Divide, also known as the Garden Wall, for almost eight miles to the Granite Park Chalet, then goes steeply down hill for four miles, where it ends at “The Loop” on the Going to the Sun Road. There we hopped on a park shuttle for a ride back up the mountain to Logan Pass. What a wonderful journey you have had. Our country is amazingly diverse & beautiful. People who have not explored the USA are missing out on a lot of enjoyment & truly marvelous locations. Looks like my kind of hike, except maybe the length. I’ve been to Glacier NP twice and never had made it to Logan’s pass, since both times were in early June and the road was still closed. Maybe someday. I’m sure you will make it someday at a later date… We were there the end of August to mid-September. 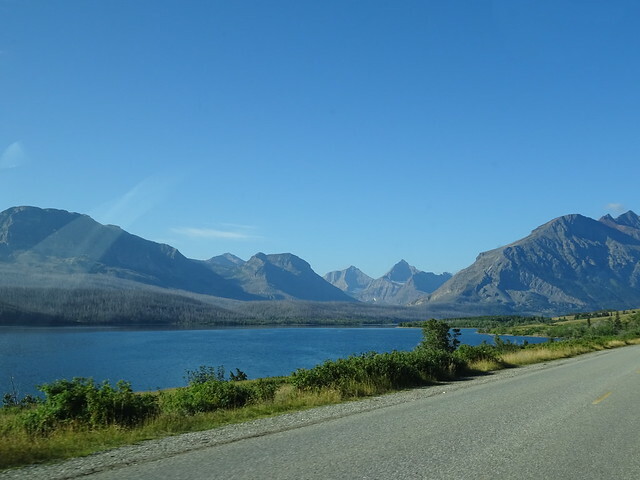 Glacier’s campgrounds started to close for the winter and we moved south. I can’t believe that was nine years ago, already!